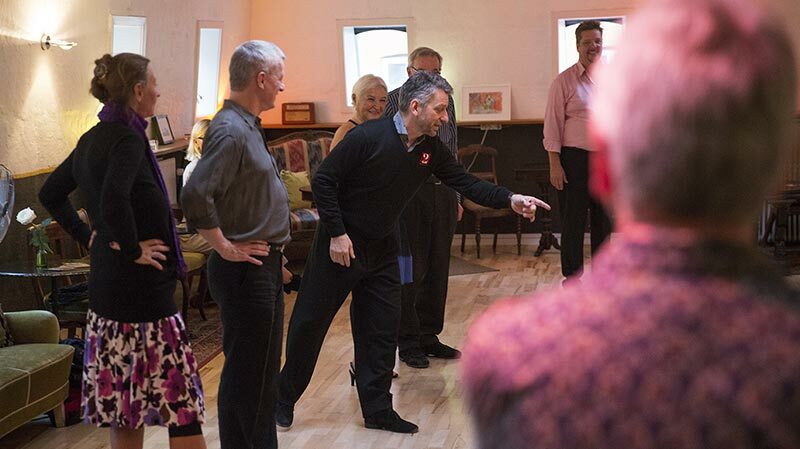 On the Intermediate level we strive to enhance your joy of dancing and explore the possibilities of tango even more. The classes focus on giving you a greater security in the fundamental technique, musicality and communication, so you can experience flow in your dance. We will expand your repertoire, so you can dance with more freedom and variation in the milonga. Specific repertoire will be molinete, sweeps, variations in single and double-time rhythms, milonga and tango waltz. Later you will be introduced to voleo, sacada, gancho and giro. Your level: You get safely in and out of the cross, the forward and backward ocho and have a reasonable navigation on the milonga floor. Your musicality has elements of both single and double-time rhythms. You improvise at a basic level and have knowledge of the close embrace. In other words you’ve been dancing tango between 9 months and 2 years. We are pleased to welcome these two wonderful teachers and dancers again at our studio in May. Bruno and Rocio represent the young tango scene in the most elegant and beautiful way. The program will be up soon! On our schedule side you can find all our classes in our Copenhagen studio and in Hillerød.